How is Christ Presbyterian different from other churches? Below are some of our most important distinctives. Churches have various ways of describing themselves. Some identify themselves by an important historical character (such as Martin Luther and the Lutheran Church). Some churches link their identity to a particular doctrine (such as the view of baptism held by the Baptist Church. Other churches are known for their view of the Christian life and experience (such as the particular methods that came to be identified with the Methodist Church). The word “Presbyterian” comes from a Greek word that simply means “elder,” which is the biblical term for men who are called to oversee the life and ministry of the church (1Tim 3:1-7, 5:17). Presbyterianism also includes some other important elements, such as a commitment to Reformed theology, and a high view of Scripture, but unfortunately many churches bearing this name have abandoned these distinctives, particularly under the influence of theological liberalism. As Presbyterians, we unashamedly and unreservedly affirm that the Bible and the Bible alone is our authority for all matters of faith and practice. We stand for the Reformation principle of Sola Scriptura. “Scripture Alone” is our authority in all matters. The Westminster Confession and Catechisms are “authoritative” only to the extent that they accurately reflect and expound the teachings of the Bible. They are authoritative in much the same way that a sermon or commentary is “authoritative”. We value the statements of the Confessions, but we believe and obey the Bible alone. We believe theology is important. We want everyone to understand clearly the theological convictions of our church. Christ Church is a confessional church whose system of doctrine is summarized in the Westminster Confession of Faith. The Westminster Confession expresses a theology that may be described as catholic, evangelical and reformed. When we describe our theology as “catholic,” we are not referring to the Roman Catholic Church. The word “catholic” simply means “universal.” The theology of the Westminster Confession is “catholic” in that it reaffirms the doctrines held universally throughout the church of all times and places, such as the great ecumenical councils of the first millennium of Christian history. These great councils affirmed the Trinity, the deity of Christ, Christ’s atoning sacrifice, and other doctrines that are integral to historic Christian orthodoxy. Our theology is “evangelical” in that it affirms the “good news” recovered at the Protestant Reformation, of God’s amazing grace to sinners through the merit of Christ’s work on their behalf. The five solas of the Reformation are at the very core of our teaching, preaching and worship: Scripture Alone, Christ Alone, Grace Alone, Faith Alone, Glory to God Alone. Justification is by faith alone. Sinners are declared “righteous” by God solely on the basis of the righteousness of Christ imputed to them and received through faith alone. This faith is not a work of human effort or merit. It is a gift of grace given by the Holy Spirit. In his letter to the Ephesians, Paul wrote saying “For by grace you have been saved through faith. And this is not your own doing; it is the gift of God, not a result of works, so that no one may boast” (Eph 2:8-9). In other words, salvation is a gift from start to finish. This is what makes grace so amazing! Christ is the only mediator through whose work we are redeemed. Salvation is by God’s sovereign grace alone, through faith alone, on account of Christ alone. “For God so loved the world that he gave his only Son, that whoever believes in him should not perish but have eternal life (Jn 3:16). Because our salvation was accomplished by Christ alone and was given to us by grace alone through faith alone, God alone should be praised honored and glorified. Therefore, in view of God’s mercies, we are called to present our bodies as living sacrifices, glorifying him not merely with our lips, but with our lives (Rom 12:1-2). Our theology is “Reformed” in that, in addition to catholic and evangelical theology, we are in general agreement with the doctrines outlined by Reformed theologians (such as John Calvin, Theodore Beza and Francis Turretin) and the Reformed Confessions (such as the Heidelberg Catechism, the Synod of Dort, the Belgic Confession). Moving beyond general agreement, our particular denomination officially subscribes to the theology of the Westminster Standards which were forged in 1646. These doctrinal standards include the Westminster Confession of Faith, and the Westminster Shorter and Larger Catechisms (which you can access here). For us, these are not merely historical documents, but texts which outline the faith and life of Christ Presbyterian Church. The theology of the Reformed Confessions (in general) and the Westminster Standards (in particular) is completely God-centered and is structured on the unfolding drama of the covenant of grace and redemption. The worship at Christ Presbyterian Church is “liturgical,” meaning that there is a regular order and structure to our worship. While every church has a liturgy or pattern to its worship, the important question is whether or not the pattern followed is biblically informed, or man-centered and entertainment driven. We do not value our liturgy merely because it is old, but rather, because we believe it follows the grain of Scripture. A printed liturgy enables us to worship biblically. Since God determines how we are to worship him, we want our liturgy to be based upon Scripture alone and not left to the opinions and preferences of people. A printed liturgy enables us to worship corporately. Since worship is not a spectator activity, we want everyone to be able to participate in an informed and meaningful way. Printed prayers, responses, acts of adoration, etc., enable us all to be involved in worship as a body of believers. A printed liturgy enables us to worship freely. Everyone is able to know what comes next and who does what. We are freed to focus upon our God and not upon the service itself. 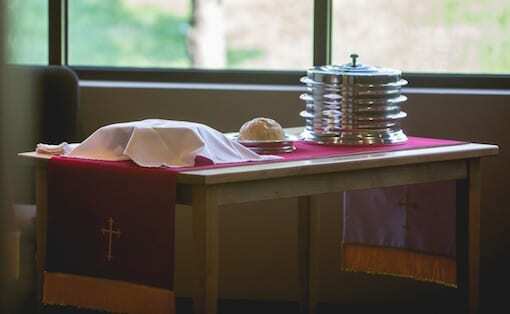 An essential part of our weekly worship is the celebration of the Lord’s Supper. We believe this means of grace is an important part of every believer’s growth in the grace and knowledge of the Lord Jesus Christ. Through both the preaching of God’s Word and the administration of the sacraments, the Holy Spirit strengthens his people in their relationship with Christ. 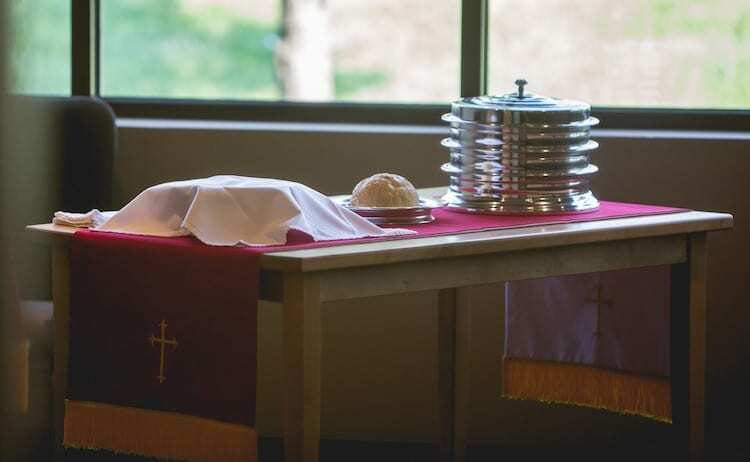 All believers who are baptized members in good standing of a church where the Gospel of grace is fully affirmed are welcome to participate in the Lord’s Supper. If anyone is not certain of their relation to Christ, or have any questions about participating in the Lord’s Supper, we invite them to speak with one of the elders or the pastor before or after the worship service.